Mei was the cutest one in the world. Hua Yue looked at Mei who was eating a roast pig trotter with a smile. She never thought that the world could be so beautiful. After making the decision which was equal to betraying her family, conversely, her heart was peaceful, because she didn’t need to hesitate between her family and the Starwing Knights again. She wasn’t just a puppet of her family. She chose to follow the call from her heart, walking into a brand new world. According to her family’s plan, she should leave the Sword Palace as soon as she had obtained the blessing of the White Lotus Secret Treasure. After leaving the Eastern God’s Domain, she would change her name back to the western style name and become a deputy leader of the Shinra Knights. After several years of experience, she would be able to be the leader legitimately, becoming a genuine Holy Knight. The Hua family was actually a branch of a famous knight family. The family’s name, “Hua”, was just to be in line with the custom of the Eastern God’s Domain. Freya Lunar Solda was her real name in the genealogy. If she went back to the Knight God’s Domain, she could inherit the well-known Shinra Knights. It was an old Knights that only followed the orders of the White Golden Rose Bloodline. Over 11 knights had achieved the peak of the sixth rank in the Shinra Knights. The alternate leader of the Shinra Knights now was a Sky Knight, a well-known legend ranked knight. Her family had paved the way for her. Even in the tutors of the Sword Palace, there was a hero ranked knight who came across countless star bridges, coming to this remote sword domain from the distant Knight God’s Domain. Everything started from the moment when her White Golden Rose Bloodline was activated. After confirming the power of her bloodline, she would be qualified to use her true name, Freya Lunar Solda. This was the tradition of the Hua family. Only the descendants whose bloodline had been activated could call themselves “Solda”. In the endless god’s domains, the bloodline of Solda was all over the universe. However, only the people who had the original White Golden Rose Bloodline had the right to use this name. Now, Hua Yue decided to give up this holy and glorious name, giving up her right of succession to the legendary Shinra Knights. Freya Lunar Solda’s fate had been determined from the beginning, she could only inherit the Shinra Knights, following the orders of the family. However, Hua Yue’s fate only belonged to herself. She wanted to control her own destiny! Compared to the invincible Shinra Knights, Hua Yue preferred to choose the current Starwing Knights. Compared to the Shinra Knights, undoubtedly, the Starwing Knights was just a flower bud, growing up quietly surrounding the core named “Mei”. 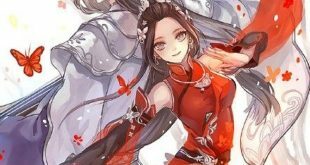 However, Hua Yue believed that the flower buds would grow up happily beside Mei, and finally become a beautiful flower garden. “Mei poisoning” was a toxicity symptom, but also a blessing too. In a gloomy basement, not far away, several stray dogs lay on the ground, shivering with cold. These ill-nourished dogs could do nothing but look at the black demon dog prince in fear. “I think it’s a better idea to eat a hundred hero ranked humans.” Qumran gazed at Childe San Quan in disbelief. Although it had wisdom, it couldn’t be called smart. Even Wisdom Black Demon Dogs only knew how to eat humans in the most efficient method. The Black Demon Dog Race naturally couldn’t understand schemes and intrigues. Even Cerberus didn’t have this talent. “This is ‘Capture Mei’s Heart’ plan!” Childe San Quan knocked the blackboard in front of him and pointed out the main point. “Ha?” Qumran was flabbergasted. Capture the heart of that monster maid? Isn’t that suicidal behavior? Sure enough, it’s a better plan to eat a hundred hero ranked humans! “Humph. She is just a maid, I have a hundred methods to solve her.” Childe San Quan said confidently and knocked the blackboard with a calm look. “I know.” Qumran looked at these stray dogs. Even when he was still a stray dog, he was an overlord of stray dogs. These stray dogs looked undernourished, they must often be hungry. As the war machine of the demons, black demon dog had the bloodline of the demon wolf, which was also the origin of common dogs. Therefore, Qumran naturally could control almost all common dogs. Of course, true-bred Golden Princess was an exception. Actually, the origin of this kind of dogs had no relationship with any wolf, they were blessed by the power of stars.